Fabric shopping with my boys is always an adventure. Recently, Youngest Son and I went to Joann's to find some fabric for a pullover hoody like his brother's quick fleece hoody. Being brothers, they want the same things...only different. Middle Son likes to be invisible. He chooses dark and very non-flashy, like his grey Ethan shirt. Well, Youngest Son is a little flashier. He wanted some safety orange fleece for his pull-over. I was concerned about my eye sight sewing such a bright color, but knew it would be a quick sew and decided to go for it. What mom wouldn't want their very active, often wandering nine year-old boy not to wear safety orange? I bought a yard and a half. I was using Kwik Sew 3773 again and it didn't give the yardage for just the top, only for top and pants. I was guessing on the yardage. that is placed on top of fabric before basting and stitching. removed. The water soluble stablizer pulls right off. 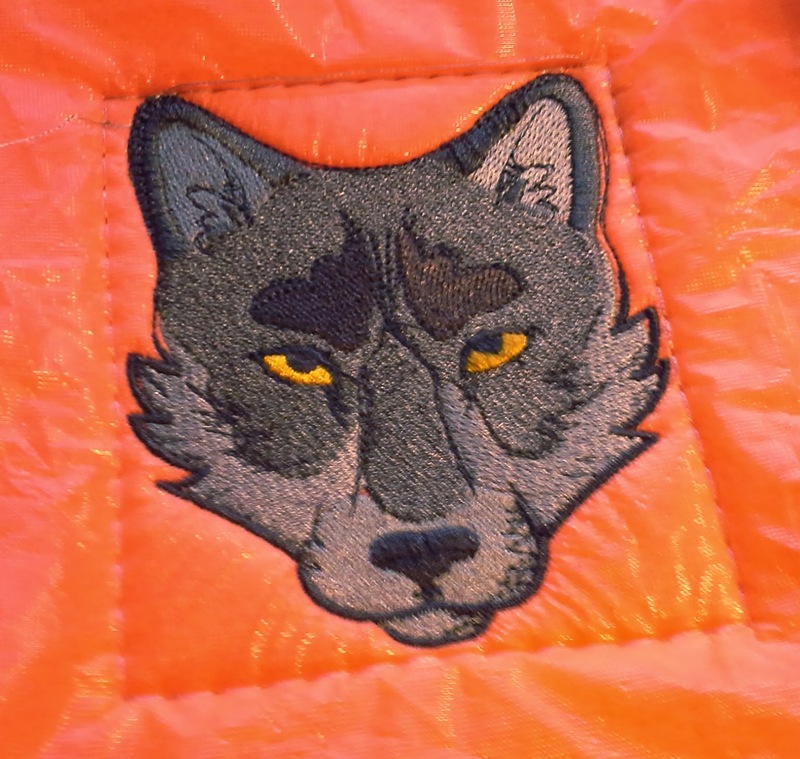 I decided that the safety orange (don't get it confused with orange, this color is brighter than the road workers washed out-in comparison--orange) might need some toning down, so I asked Youngest Son if I could add some embroidery. Of course, he had to object to every suggested design. He wanted the face of a wolf. Luckily, I bought this in a set from Embroidery Library a few years ago and have used and others from the set many times. will be covering with an iron-on layer. While he was at school, I spent less than 30 minutes tracing the pattern and cutting the fabric. It took me about the same to choose the embroidery threads and hoop the fabric. I used a cut away and hooped the fleece and stablizer in my smallest hoop, 120x120mm. Unfortunately, where I thought I wanted the design didn't fit into the hoop well. So, I unhooped the fleece and placed it on top of the stablizer, which I did hoop. Because fleece can hide stitches, I placed a some water soluble stablizer on top before basting. 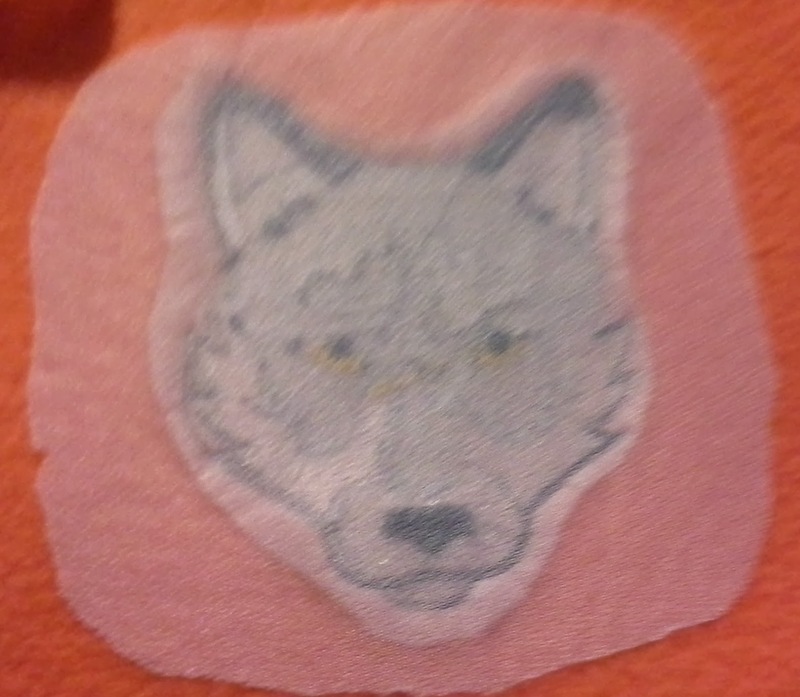 Using the basting function on the the embroidery machine, I basted the cut away stablizer, fleece and water soluble stablizer together and started stitching the design. 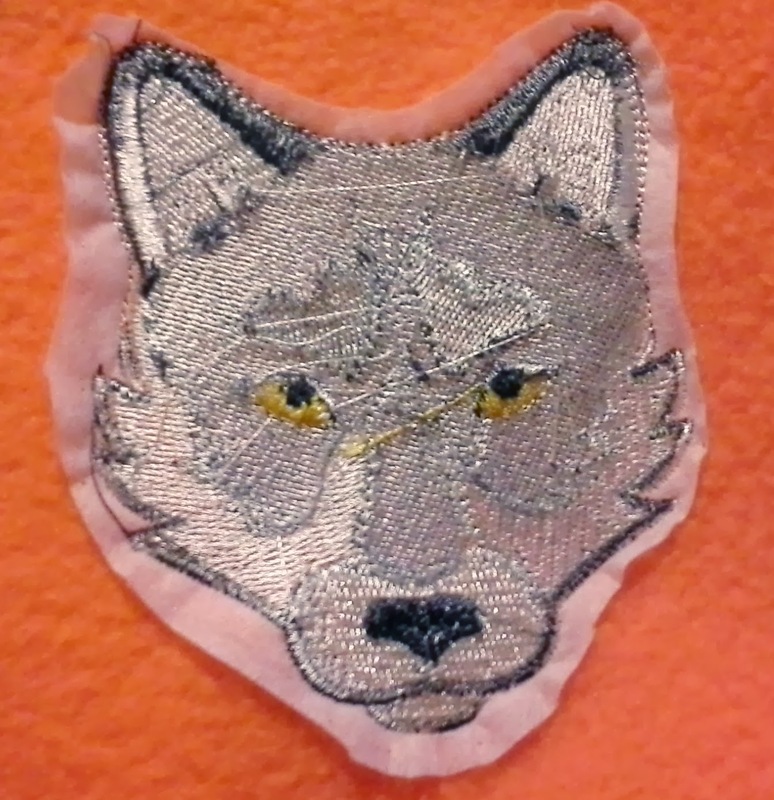 One of the best parts of machine embroidery is that the machine runs by itself and it should not be left alone. I often use the time to do a little clean up. I put away the pattern. I cleaned and rethreaded the serger. I loaded the dishwasher. Then I needed to stop the machine to pick up the boys and run some errands. Time sure flies. After cloud cover stitch has been ironed in place. It is now soft, hides stitches and just looks better inside. When we returned, I finished stitching the design, but wanted to wait to do the actual sewing. I was going to wait until the next day, but Youngest Son is very insistent. I waited until they had left and worked for less than an hour before he returned. I only had the sleeve hem and hood to sew on when he got home. He was so excited that he watched over my shoulder until I finished. I had no choice but to finish. This project was the perfect time for me to use my new labels. I wasn't sure about using it, but like I said, Youngest Son is insistent. I ordered my labels from NamesLabelsandTapes.com. I recently became an affiliate for them and wanted to know their product before recommending them. I love them. 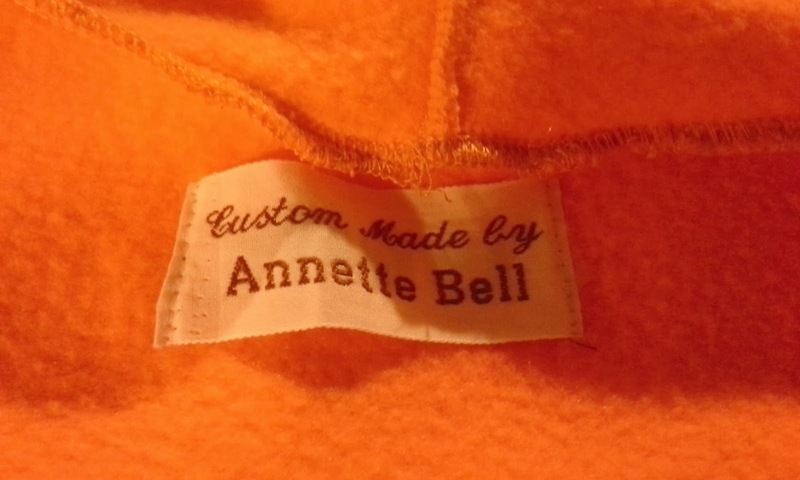 How fun to put my label in the clothes I make! I know. I'm a geek. Well the ordering process was easy. Well, except for choosing what I wanted, how I wanted, what size, how many lines, what colors, how I wanted to attach.... I really was fun. I went basic and had it kid and Mr. Toad approved. After all, it will be in their clothing too. What do you think? Do you use a label? Would you use a label? Great job! I use labels, but they are cotton fabric sheets from Joanns that I made some time ago. I would love to order something more professional-looking like the ones you have. 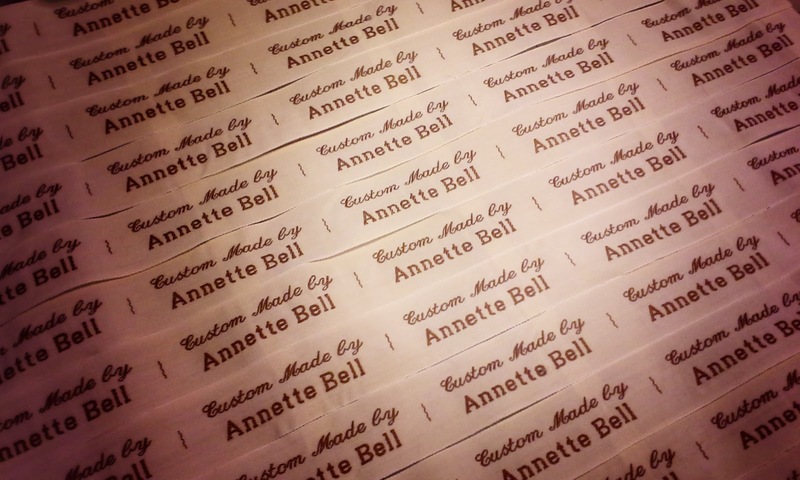 It really does feel good to put your own personal label on something you made!!!! Vanessa, I think I have the same fabric sheets. I never used them. I am impressed with the quality. I did order the larger ones. I asked the boys if they would rather have name labels, they said no. I also suggested/threatened to put "Mama Made." That didn't go over well. I love your labels. I have been contemplating making my own but seeing yours makes me want to spend the money and just get them! Annie, I debated for years on this. I'd look, then decide I could do it myself--and never did. I am glad I did it and am impressed with the quality. They look like what is in Ready To Wear. I can't wait until I can get an embroidery machine!! I've bought a few designs already, maybe that might make it manifest faster:) It's funny I have the flashy fashion plate daughter and the reserved one that must have some black in all of her clothing. I had some labels made up out of my husbands handwriting with my nickname so they say 'ShortzMade'. Mama made wouldn't go well with my crew either i'm sure. Aren't kids funny? When you are ready to start looking for a machine, try to get one that can embroider at least 8x10 inches. Most people who get smaller outgrow them before they can afford to replace them. That is cute! Looks like a husky, too. Thanks. I'm trying to let my boys have some design input. Wait until I sew his Easter outfit. Not my choice! Those tags are awesome, I should try some! I can completely understand the plus side of a kid wearing bright orange... I need to find some brights for my son now that summer is coming and he is running away from me! This is my runner. He was always running from us. Luckily, he likes neon and bright colors. He also like black, but I try to discourage the dark colors. Being the last of four kids, he tries to be cool and act older, but I get occasional glimpses of my little boy. I hope he doesn't see this comment, he'll act even older! Labels are so much fun! So cute that he's standing over your shoulder waiting for you to finish :) Love the hoodie! Very very beautiful ! Color combos are good. I find very difficult to work with silk threads. For me it always gets tangled and it irritates me a lot. But u r very comfortable with silk thread. Isn't it?